I have made my way to Hawke’s Bay and settled into the charming, idiosyncratic, slightly broken and mildewed bungalow next door to the winery that I share with three other cellar hands. 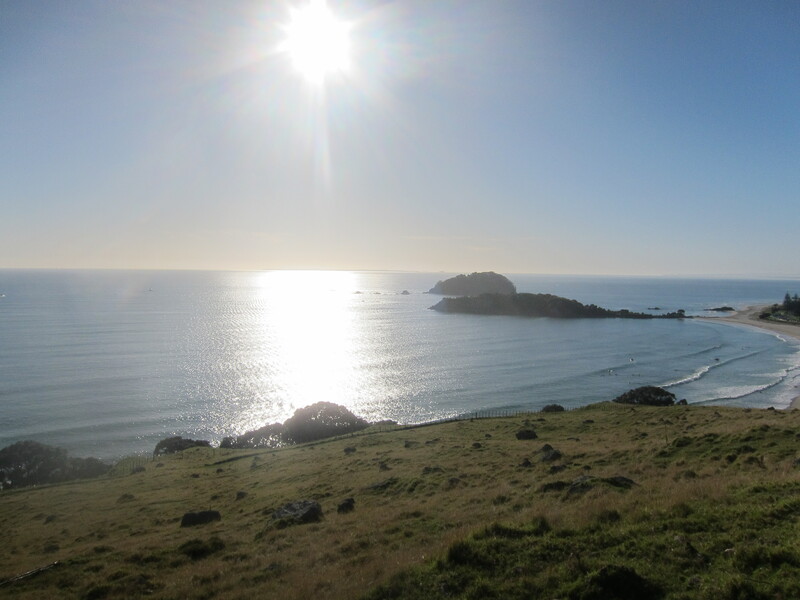 After a day and night spent in Auckland in a post-13-hour-flight daze, I headed south to the Bay of Plenty and Mount Maunganui, which I climbed gleefully and awestruck, laughing at the sensation that I could see to Antarctica (I couldn’t). Hanging off the edge of the southern hemisphere in the explosive light, the earth seemed to be leaning back to uplift us, presenting us like an offering to the sun. Breathtaking. 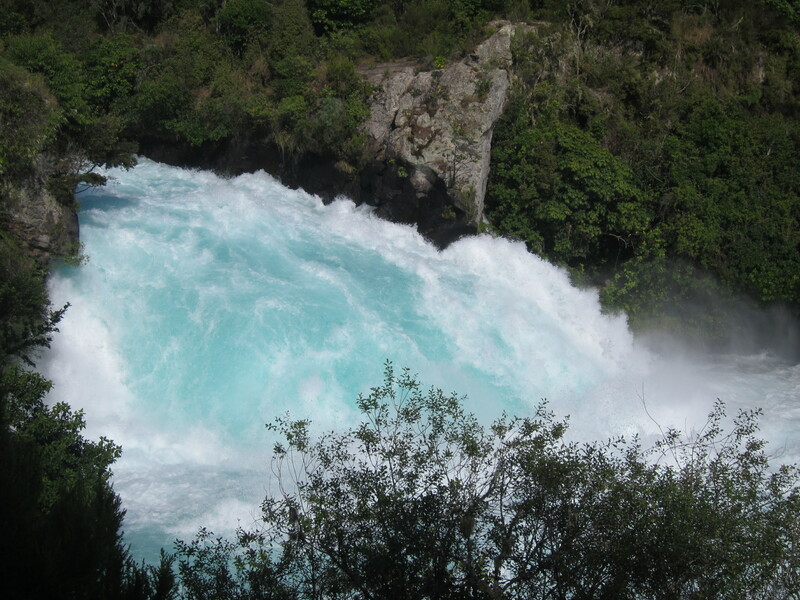 From there, further south to Taupo, where I hiked into Huka Falls and its hot springs and swam in the lake that tumbles out of the snow-capped volcanoes of Tongariro. And finally, over sheep-filled cliffsides and rainforested valleys and expanses of cornfields and orchards and – by god! 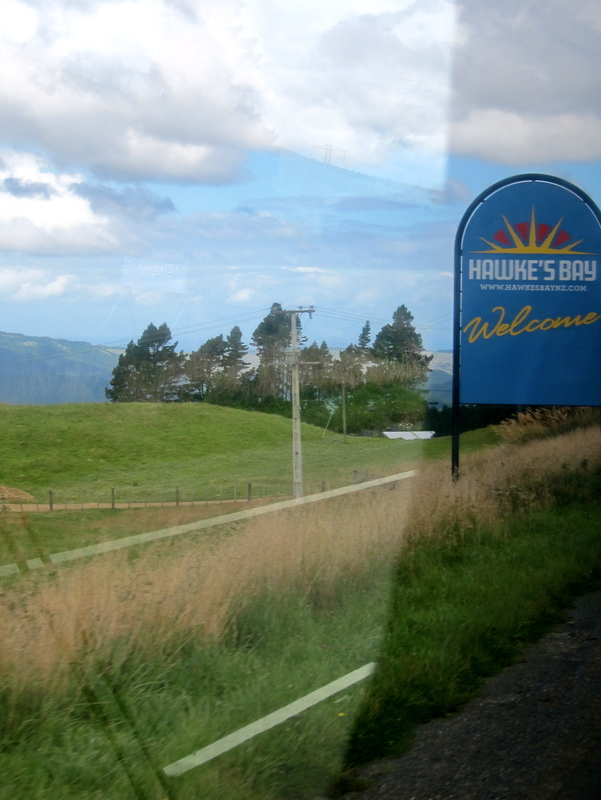 – vineyards, to Hawke’s Bay, my home until the grapes are all crushed and stirred. As of yet, things are still slow at the winery – maintenance, harvest prep, rackings. After a cool summer, harvest is behind schedule and winemakers are getting nervous. The conversation is like déjà vu from 6 months ago in California, as picked dates loomed despite low sugars and rain in the forecast. We’re holding our breath. Today we passed around a Chardonnay sample at the winery; a cloudy, split-pea green juice that, at 17 Brix, is nowhere near where anyone would like it. Raising the winemaker’s blood pressure: there’s already botrytis pressure in the vineyards and there’s more rain ahead. The winery is committed to making the best possible product and is hard at work in preparation for harvest. From my front porch I can see the assistant winemaker’s station wagon parked outside the winery hours after the interns have been sent home, as was the case with the overworked and deeply passionate folks running the Donelan cellar. I am working at a good-sized shop with a larger parent company that is nothing as monstrous as Gallo but about as proportionally corporate. We’ll process a good ten times what Donelan did in 2011, and at least twice as much as some of the large but still independent wineries my Sonoma friends worked at. That said, this place is not a giant and it is NOT known for plonk. Like many wineries worldwide, there are three tiers of wines, ranging from the inexpensive to the pricey (though nothing at wildly extravagant price points). As with any winery, many business and winemaking decisions will go into the allocation of wine lots amongst the different tiers of wines. But there’s also room to shuffle wine around, so I get the sense that, barring devastating amounts of mold or dehydration, there’s a little more flexibility than at Donelan, where we cheekily repeated to one another “quality, quality, quality” on hour 10 of cutting moldy fruit off the vine ourselves before a pick. I’ve been told that we almost never leave fruit in the vineyard here, come hell or high water, although our viticulturalist has started dropping fruit to hike up concentration in the clusters and pick up some speed. Let me be clear – none of this is meant to discredit the winery, merely to cast it as a different category of operation from what I’ve experienced to date. They are making some great wines and being very smart about it, too. The winemaker has intimate knowledge of the many wines and vineyards and, as he pointed out the ancient and rarely-used sorting table, stressed his commitment to selectivity in the vineyard to maximize cellar efficiency – music to my Donelan-trained ears. From my limited time in the cellar thus far, I have found just about everything to be different, mostly in terms of scale. Like, um, the 12-ton press? The hopper holds 10 tons. Most vineyards will be machine picked, dumping their yields straight from a truck right onto the crush pad, which is built into a shaft, where a monstrous destemmer waits to ruin my life, although I still hope to win its favor through perseverance and sweet-talking. The cleaning processes are noxious with a total (and unfortunately industry-standard) disregard for water economy, a far cry from Donelan’s green cleaners and endless attempts at conservation. Almost all lots will be inoculated. Sugar adds are legal in NZ, as are acid adds (infrequent, I’m told, given the microclimate). Just about everything gets pumped into the wine, unless it’s organic, in which case nothing is pumped into it – except small amounts of sulphur, which is one of the main things that organic wine in the States can’t have, but nevermind. The tanks are massive. Punch-downs will be pneumatic, so no more strapping myself to the ceiling and jumping on top of a few hot tons of fermenting fruit, which I’m horrified to discover gave me a pang of longing for the Donelan cellar. All that said – so far I like what I see. The team is promising. The facilities are impressive in most ways and frustrating in others, which is a given. The winemaker is far more involved than many in his position at comparable-sized operations might be. My supervisors cultivate a good energy and have a lot of insight to share. And things are right about on schedule: I cut myself twice on my first day and then stuck my open wounds into acid. And I smiled to myself as I nursed a split cuticle in the heady aromas of wine drifting from some corner of the vast cellar, amidst the comforting sounds of pressure washers and the slightly less comforting kick in the face from sulphur vapors. I’m a little wary of the challenges ahead but I am steadfast in my resolve to pull my weight on the team and to get as much out of this experience and learn as much as I can. I’m heartened by such muscle memory and familiarity as I have at my disposal and I’m crossing my cut fingers that they’ll keep me in line.